In Glen Ellyn, there is a small mosque tucked away in the trees along Route 53. The multi-level white stone construction is very pretty. It has a metallic dome at the top that always catches my eye. 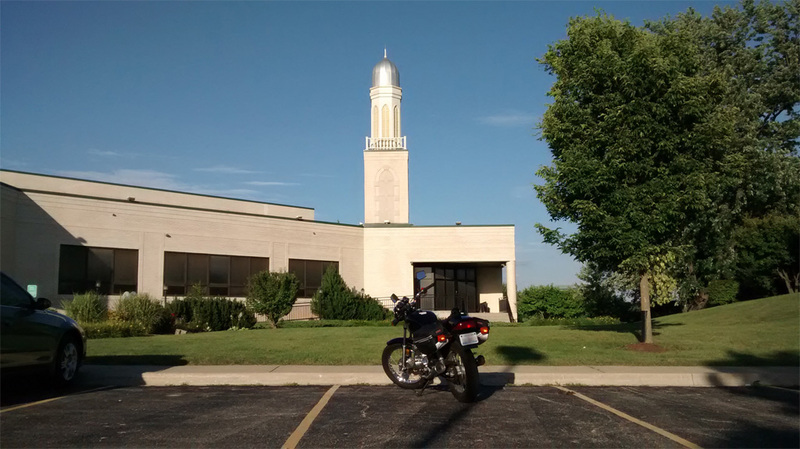 Since it’s Ramadan, I decided to get a proper look at it yesterday on my post-work ride. The name of the mosque is Masjid Bait-ul-Jaamay, which according to Google, translates as Mosque Temple something. Not very helpful. 😀 It wasn’t able to translate the ul-Jaamay part. If I were to guess, “ul” probably means “of”. Perhaps “Jaamay” is a name or a place? In any case, this mosque was built by members of the local Ahmadiyya Muslim Community. There are a few others mosques in the area that I have seen in passing, and probably many more that I simply haven’t noticed. One is located along I-88 and its architecture is just stunning to look at from a distance. I’d like to see that one up close one of these days. I’ll have to figure out a route there that doesn’t involve the interstate, however. :p Another one is located in Streamwood, IL, which is a bit further out. As you can see from the photo gallery on its website, it features a lot of intricate mosaic work on the exterior. I will get to those some day. Hopefully, I’ll have my camera with me, too.